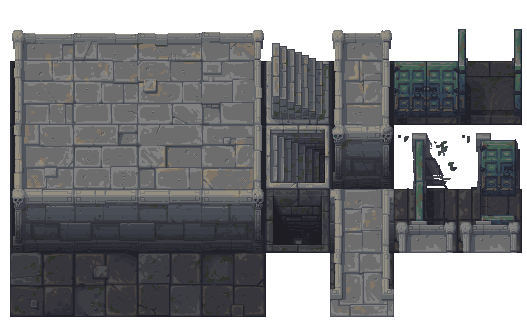 Working on a temple tile set for a project, i'm taking over from a considerably more talented artist as you can see below but i'm trying my best to keep up. Would love some suggestions, though I don't have the luxury of time to fully remake anyone given thing except maybe the ceiling. Regardless, any crits would still be very welcome. Your ceiling is shaped like boards of wood and they don't match the wall, the floor, or the style of the setting so much. If you look at the previous artist's, the top surface matches the wall in texture and shape fairly closely. It's almost the same wall segments with different highlighting and shadows. 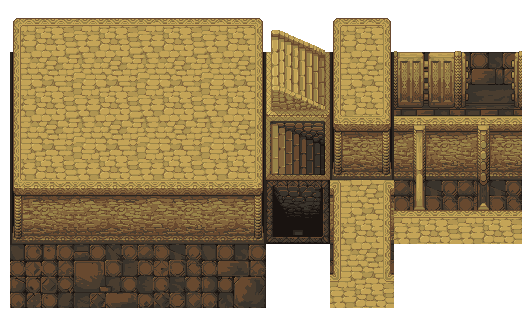 As far as your own work goes the floor, pit, and wall have a pretty solid direction as far as style goes, but the top is pretty barren of detail. It looks unfinished compared to the rest. Why don't you try using the wall texture on the top as well? Or perhaps giving your top surface some more surface detail to the smooth panels. 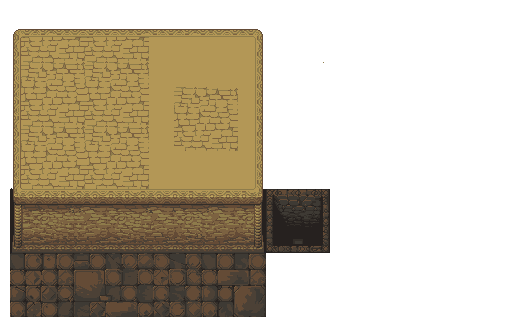 For dungeon type games, you might want to transition to black the ceilings/solid rock/etc, if they're not visible to the player on the ground. I think your floor is very nice. The previous artist has run against the overhead-with-some-perspective problem with the vertical door I see - it's larger than the horizontal door. This isn't a simple problem to solve, as you want all floor tiles to remain visible rather than being obscured by walls. yeah I can't transition to black as the other assets already don't. not really in charge of that decision. Here is a new attempt at the ceiling, there are a few tiling issues that i'll iron out later, my real question is how do I add highlights to this thing? I've been trying for the last hour to no avail. Definite improvement on the ceiling. The problem with the highlights on the ceiling is that there's nothing indicating any real sense of depth. The best you could do with this texture is recess some of the blocks by giving them more clearly defined borders against the others. If you still find you need a slight highlight, put a few pixels in the top left of some of the non-recessed blocks. I'd suggest highlighting in clusters though, to give the overall texture more visual interest. I attempted to follow what you explained and hopefully an improvement has been made. 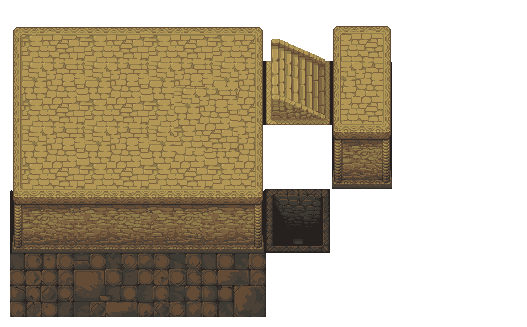 it still tiles a bit obviously but it should work even better when I get around to making some alternating tiles. Great improvements man! Definitely exactly what I was suggesting there. And your stairs look great too. 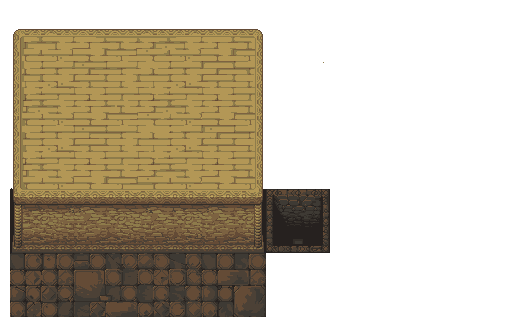 So I tweaked the roof and changed the pallet as a whole. Also added in stairs and doors. The set is "complete" but I still need to make some alternating tiles for the roof and fix some of the cut and paste issues for the wall. Yeah its looks now more vibrant which is nice touch! The older one looked little bit dull. I really dont have any Criticism because its looks already pretty damn fine. Good work man!